Green olive tapenade with fennel pollen is a crowd-pleasing appetizer. I always appreciate a great “Wow! What is it?” ingredient–something that treats everyone at your table to a new taste sensation. Fennel pollen does just that. Collected from the blooms of wild fennel, the delicate spice recalls the subtle licorice tones of fennel, but in a sweeter, more ethereal way. I use it often as part of a dry rub in meats; I especially love it on pork tenderloin. My No. 1 use for it, however, is in my green olive tapenade. 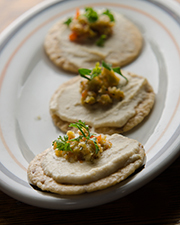 You simply slather some purchased hummus atop a cracker (Trader Joe’s Original Savory Thins are great for this), and top with a wee bit of the tapenade and a little snipped fresh parsley. Place the olives, oil, garlic, fennel pollen, red pepper flakes, tarragon and curry powder in a food processor. Process until the mixture becomes a coarse paste, scraping down the sides of the bowl occasionally. Transfer the tapenade to a bowl and serve at room temperature. Store leftovers in the refrigerator in a tightly covered, nonmetal container for up to two weeks. Makes about 1 cup. Find the fennel pollen ($9.95 for a 4-ounce jar) at Allspice Culinarium (400 E. Locust St. in the East Village, 868-0808).